BATTERY PARK — This old bird has a couple tricks left up her sleeve. 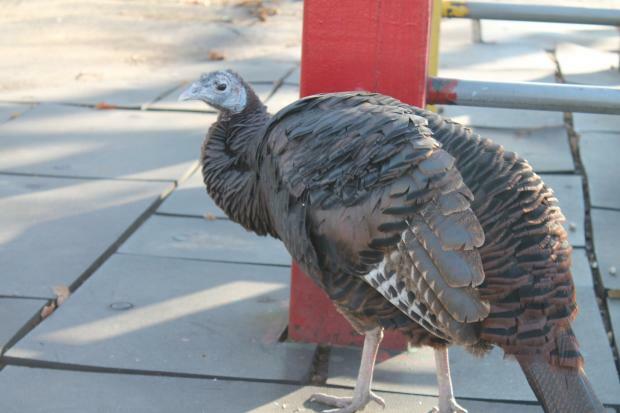 Zelda, Battery Park's beloved resident turkey, managed to survive Hurricane Sandy, despite widespread damage across lower Manhattan, and will live out another Thanksgiving far from the stuffing or gravy bowl. Parks officials believe the elderly hen, who many hadn't expected to make it another year, rode out the storm by clinging to the tree she often sleeps in, as flood waters gobbled up the rest of the park, staffers said. “They have those powerful feet. They just clamp down on the branch," said Pat Kirshner, director of operations and planning for the Battery Conservancy, which oversees the park and helps Zelda survive. The storm ravaged the small playground where Zelda often hangs out, ripping one of her favorite trees out by its roots, crushing jungle gym equipment, and tossing colored wooden pieces around. A Parks Department staffer said Zelda was missing for about five days, but emerged unscathed. “She's a wild bird. She knows what she’s doing. She had her wits about her,” said Kirshner. She emerged “a little bit hungry. But she weathered it just fine." On Thanksgiving morning, a cautious Zelda was spotted roaming around her usual stomping grounds in the park, where she's lived for the past nine years, thrilling school kids, confusing tourists, and enduring one too many Thanksgiving jokes. “People can't believe it. They don’t know what she is," said Kirshner. Asked how she'd managed to survive the storm, Zelda cocked her head slightly to the side and then went back to pruning her feathers in the shade of a jungle gym slide. Staff aren’t quite sure where the turkey came from. She first appeared in 2003, as staff were planting the Gardens of Remembrance in honor of 9/11, and she's been there ever since. While the average turkey rarely lives past six years (if it doesn't end up on a dinner plate), Zelda, whose age was unknown when she arrived, is already older than that — making her ancient in turkey time. And time is taking its toll. Zelda had a rough summer, Kirshner said, including a problem with one of her eyes. On Thursday morning, she looked grayer than last year, walking slowly around the still-closed playground, picking for seeds and hiding under damaged benches and jungle gym slides. “She's slower and doesn't look quite as sleek and as shiny as she used to,” Kirshner said. Still, she earned stares from passersby shocked to see a real, live bird on Turkey Day. “Oh wow! That’s so funny,” said Marie Bernes, 23, a student at the University of Virgina, who is originally from France, and spotted Zelda making her way through the park. Park staff said that Zelda, who has a turkey-shaped farm in the park designed in her honor, sleeps in a nest in a tree near the playground, high above the park and usually comes down around 6:30 or 7 a.m.
She spends her days exploring and foraging for food, searching the lawns and gardens for seeds, bugs and grubs. She sometimes heads to the nearby Battery Gardens Restaurant, where she likes to admire her own reflection in the glass. Zelda, who was named after the wife of novelist F. Scott Fitzgerald, has laid eggs, staffers said, but she’s never had any turkey boyfriends or baby chicks. Kirshner said they'd at one point considered looking for a mate, but decided against it. “We really don't want to get into the turkey husbandry business,” she said. Plus, she said, if Zelda were unhappy, she could simply pick up and leave. “There are a lot of single old birds in the city," she noted, who do just fine.